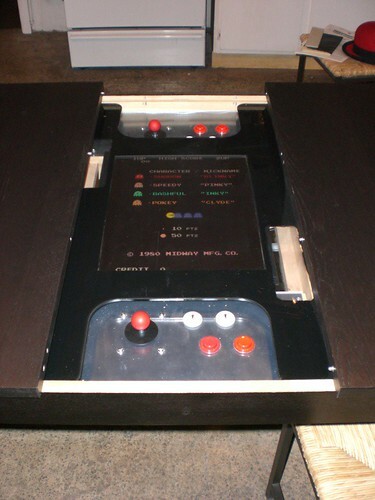 I built a MAME cabinet about 13-14 years ago - long before you could buy them and before you could buy USB 'arcade quality' controllers (it may have been before USB itself for that matter!). I got rid of it when moving up to Seattle, as I didn't have room for all my arcade cabs in the house here. I haven't thought about building another until I saw this link (via boingboing) for a cool 'hideaway' version. This was done on an IKEA dining room table, but I think it could be done similarly in a living room coffee table.